A specialist in city scapes, Berckheyde painted several pictures of bakery shops, which were popular as a subject for Dutch artists from around 1650. This inviting scene shows the baker blowing a horn to announce the morning's freshly baked bread. He is surrounded by a mouth-watering assortment of goods, including pretzels displayed on a specially designed wooden rack. 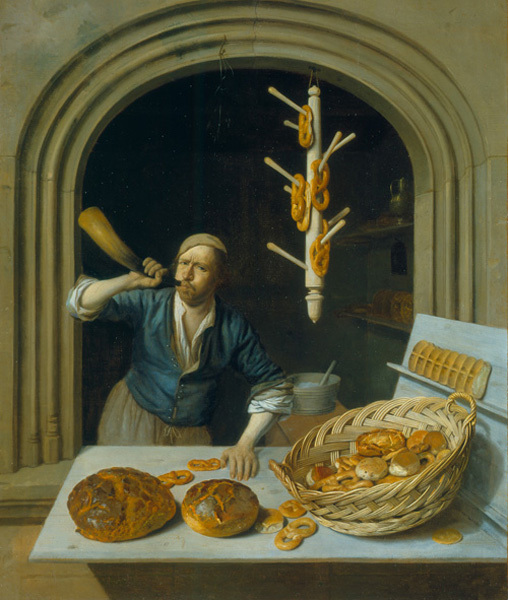 The number of bakeries was considerable in seventeenth-century Holland, and like most merchants, bakers usually set up their operations in their own homes. Because their ovens were considered fire threats to adjacent property, they were often forced to live and do business in stone buildings, which probably explains Berckheyde's choice of architecture for The Baker. As for the model he selected, while an artist would have had no difficulty finding a real baker to pose, Berckheyde, it seems, painted himself in the role.